I'm aware of the fact that my ranting and ravings on the genre have the tendency to sound like the mimicry of a broken record, but rest assured, this post is not going to play that tune again – especially after the closing paragraphs of the previous review posted on here. I've had my say on that and it remains all there's to say. Instead, I want to play Devil's Advocate for a moment and plea on behalf of Isaac Asimov, one of the most popular science-fiction writers of the 20th century, whose work as a chronicler of the future and status as the mystery genre's resident visitor may have prevented him from being identified as one of the most important mystery writers from the post-WWII era. Ladies and gentlemen of the jury, I would like, if you would, to have you join me as we take a retrospective look at the career of my client, which, in itself, will prove two things; (1) Asimov was an innovator (2) who found a weird, but satisfying, balance between the banality of everyday reality and the improbable fantasies of the detective story that can be enjoyed by connoisseurs of vintage mysteries as well as their bugbears who prefer their plots larded with realism. 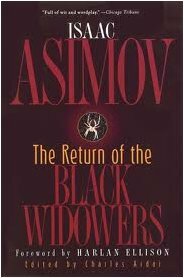 Case in point, Asimov's series of short stories featuring an exclusive dinner club, who refer to themselves as the Black Widowers, who assemble once a month in the private room of a restaurant to grill the guest of the evening and nibble appreciative on a gourmet meal – as the conversation inevitably turns to a problem that presses heavily on the peace of mind of their guest. A handful of stories deal with serious crimes, such as murder and espionage, but the lion's share is focused on problems that might baffle you and me in our day-to-day life. For example, in "The Cross of Lorraine" the members are trying to help a love-struck magician (a thinly disguised James Randi appearing here under the stage name the Amazing Larri) in figuring out where a woman got off the bus and "Lost in a Space Warp" has the armchair detectives looking for a science-fiction writers missing umbrella, but it's their waiter and honorable member Henry who fulfills the role of Sherlock Holmes when it comes to providing an answer to these petty problems. Which is sort of funny, since, this being a series of armchair puzzles, he's the only character who's always on his feet. A subtle wink at the storybook detectives? But not every guest who received an invitation for one of their monthly banquets brought a baffling, but trivial, conundrum to the table, such as was the case in "The Obvious Factor," when skeptic and paranormal investigator Voss Eldridge gave a repot of the one incident that he could not rationally explain and it turns the detective story on its ear – accurately and neatly deconstructing the impossible crime story and believers in supernatural phenomenon. I've read comments from readers who condemned this story as a cheat because it broke with one of the fundamental rules, but it's not like it was the first time that rule was broken and you should never fault a mystery writer when he uses your own assumptions to lead you down the garden path. However, even when Asimov took on a more conventional impossible situation, like the miraculous disappearance of a women from a restaurant as described in "The Redhead," he managed to come up with a believable, if somewhat simplistic, answer that would pry loose a "yeah, I buy that" from even the staunchest critics of the locked room mystery. 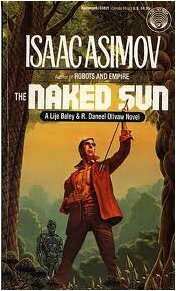 Asimov arguably succeeded with this series to comply with the modern wish for drab, everyday realism without completely dismantling the traditional detective story format. The books and stories featuring the Earth cop Elijah Baley and the Spacer robot R. Daneel Olivaw are a lot less realistic, set in a far and distant future on either a desolate Earth or among the stars that dot the night sky, but they are Asimov's best and most groundbreaking works in the genre – as they were among the first genre benders where the Sci-Fi and Mystery Genre's met on equal terms. The Caves of Steel (1954) is an absolute masterpiece, not only because it's a textbook example of the hybrid-mystery done right, but also for demonstrating that the advent of technology does not have to negate clever plotting – which is an argument that is occasionally flung at the puzzle aspect of detective stories when attempting to deconstruct it. 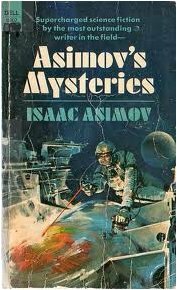 If Asimov can do it, employing futuristic, made-up technology, such as mind probes and humanoid robots, than it should also be possible with contemporary forensic science/technology like DNA profiling and computer forensics. Not to mention those Golden Age fogies who had no problem adjusting their plots to fingerprinting, ballistics and chemical analysis. It should also be noted this novel made wonderful use of the multiple solution device made famous by Anthony Berkeley and Ellery Queen. The Naked Sun (1957) is a sequel to The Caves of Steel, in which Elijah and Daneel travel to the colonized planet Solaria, one of the Outer Worlds, where the robots outnumber to their Spacer owners on its thinly populated surface – and these descends of Earth have cultivated an aversion for personal contact and communicate solely through distant viewing. This, however, has not prevented one of them from murdering a prominent genetic scientist but how? It's a interesting turn on both the closed-circle of suspects and the locked room mystery and it's often tagged as the superior of the two novels. Unfortunately, the detective elements were being phased out in The Robots of Dawn (1983) to make place for social commentary and allowed the science-fiction element to usurp the plot and Robots and Empire (1985) is a full-fledge SF novel. One of Asimov's collection of short stories, Asimov's Mysteries (1968), harbors another interesting attempt at snatching bodies from comfy drawing rooms or dimly lit alleys and shooting them to the stars, except for one person, the detective – an eccentric extraterrologist named Wendell Urth who refuses to leave Earth. Some of the celebrated cases brought to this Earth-bound space-sleuth from the deep reaches of outer space include the first murder on the Moon and deciphering the dying words of an alien creature. Admittedly, they are not among his best stories, but they are fun and something different for a change and who else but Asimov could turn an entire planet into an armchair for his detective? This collection also contains a wonderful stand-alone story, entitled "Obituary," in which an unpleasant scientist unlocks the secrets of time travel and is almost as good as Anthony Boucher's "Elsewhen" – a story with a similar theme as "Obituary." Regrettably, this is where I must end my plea for the simple reason that I'm a lousy lawyer who has not read all the available material, like The Union Club Mysteries (1983) or the remaining volumes from The Black Widowers, to make a convincing, well-rounded argument with a little more depth and while Murder at the ABA (1976) is on the top of my to-be-read pile why should I have picked that one (with this idea already in my head) when I can also pick an unread John Dickson Carr novel. It would make things just a little bit too easy and convenient for my taste, but the arguments are there: Asimov was a mystery writer who brought a new level of realism to the detective story without abandoning it and wrote a groundbreaking novel with a follow-up that is arguably even better than its more famous predecessor – showing with them that the advancement in forensic science is not a valid argument for dumbing down the genre years before it was made. 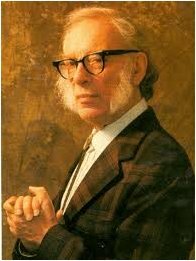 So, members of the jury, you have read the evidence put forward in favor of a verdict acknowledging Isaac Asimov as one of the most important mystery writers of the second half of the previous century, instead of a resident visitor, and it's up to you to decide how valid my arguments are. Just keep in mind that I depend on this verdict to get my horns from the Big Man downstairs. Just an FYI. The sci-fi mysteries are fun, clever variants of the whodunnit. The futuristic background is no more unfair than the period backgrounds that you see in historical detective stories. In both cases we're taking the details on trust. BUT...I never really got on with the Black Widowers tales. Too often the ones that I read seemed to depend on some piece of trivia for their solution. If you didn't know that snippet of information, then you couldn't possibly guess the answer. Just assuming that the reader knows everything that you do is rather lazy. A Christie would have given you the information that you need without you being aware that you'd been given it. I read a lot of Asimov in my youth and liked CAVES OF STEEL and NAKED SUN very much and I think they still hold up, though I believe Alfred Bester's THE DEMOLISHED MAN to be the superior of them, I read quite a few of his Widower stories and remember giving up as they seemed a bit too weak and anecdotal to really hold my interest - but we're talking about 25 years ago so I'll see if I have any of these still on my shelves and attempt a more reasoned rebuttal to my learned freind's opening statement. 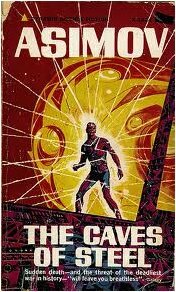 I recently reread Caves of Steel after about 40 years and was disappointed. It did not hold up well for me. Especially the characterizations of the wife and son. The sons dialogue is particularly bad, full of gee whiz and golly. Really? Thousands of years in the future teenagers are going to talk like this? I have to admit that I read the Black Widower tales (like the ones about Nero Wolfe and Archie Goodwin) for the characters and usually side with Geoffrey Avalon when he mutters a complaint how a problem always intrudes on the conversations, but the argument that those petty problems brought a new level of realism to the genre still stands – how good or bad they are is up to the individual reader. However, there were a few nice ones. I remember "Ph, As in Phony" had a stronger-than-usual plot and "The Ultimate Crime" is an unusual spoof on Conan Doyle, in which the Black Widowers assist an aspirant member of the Baker Street Irregulars with writing his obligatory article on something Sherlockiana. They decide to figure out the exact content of the book Professor Moriarty authored, Dynamics of an Asteroid, giving Asimov an opportunity to display his scientific knowledge and signed the story as science-fiction author. Henry's answer is way, way out there. :) And of course the stories mentioned in the post above. But yeah, plot-wise, not one of the strongest series but I always enjoy reading them. I have not read The Demolished Man, but the title has been jotted down for future reference. Sorry to hear the book didn't held up and I guess you have a point about the language. He could at least have followed up such an uttering with a futuristic, cultural reference like "Gee, this is too strange even for interstellar school." To further your thesis, Asimov's abhorance of violence helped cement his place in mystery fiction. On those few occasions when his mysteries involved murder, the deeds were done without violence; that is, they took place offstage and were as bloodless as possible. Violence was not something a rational man such as Asimov could endorse; rssther, his mysteries glorified logic and reason, tempered with an insightful knowledge of human behavior. It should be noted that Asimov also published a book of Sherlockian limericks and a collection of juvenile mystery stories. He was also editor or co-editor of a number of mystery anthologies. Much of his science fiction (especially his early robot stories) were nothing more than puzzle stories in futuristic trappings. I'm glad Jerry posted his comment, because it reminds me that one of the "I, Robot" stories - "Little Lost Robot" - is an excellent mystery, and pretty good science fiction, too. I though the Black Widower mysteries were good but very slight, whereas CAVES OF STEEL and THE NAKED SUN were pretty good, though it's been 25 years since I read them. Although it's probably less well known, the novelisation that Asimov did of FANTASTIC VOYAGE is an excellent piece of work. From a fun,silly script he turned out a gripping, well characterised novel. One of the fascinating side effects of having a scientifically literate author doing the book was that it dealt with issues that the scriptwriters never even considered (if light beams aren't miniaturised, how do you see?/ can you fill the floatation tanks of the submarine with un-miniaturised air?/ how do you get a broken up submarine out of the patients body at the end? ).